Why don’t I live in German Village again? Seriously. I think I’ll just move there to be closer to Pistacia Vera. I will, of course, gain 35 pounds over the course of a week or two because I would be there every. day. Three times a day. I knew the pastries were good. I’ve had them before. The coffee is hot and strong and delicious from Cafe Brioso. And the shop is so lovely and light and minimalist. I know all these things. But today, there was something magical about the perfectly arranged platter of six (!!) lovingly crafted sweets, my tasty Americano and a November day when it’s almost 70 and you can sit in the pretty little side courtyard and close your eyes and imagine you’re in Paris. I close my eyes and imagine that Cherub is behaving herself, too. But, alas, I’m a dreamer at heart. 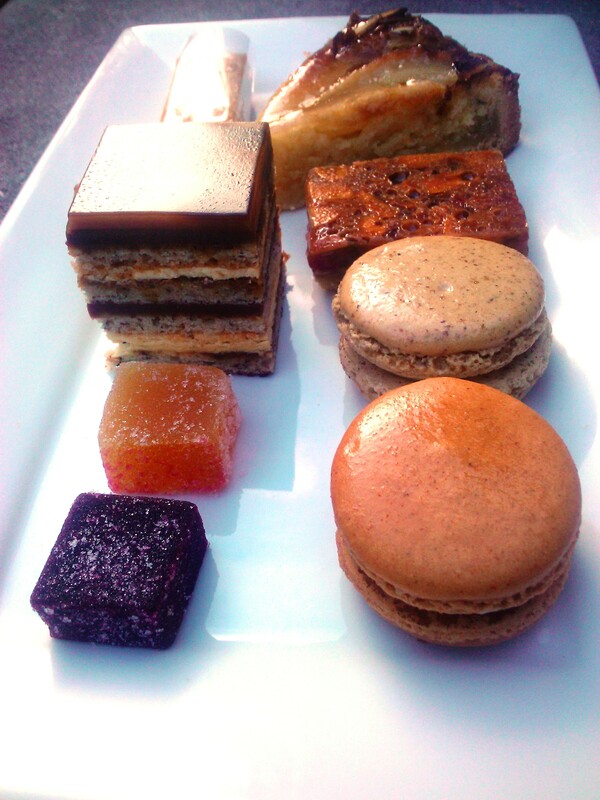 The $10 menu, specially designed for Dine Originals Week included left row, bottom to top: fruit pates (black currant champagne and orange ginger), a mocha praline jaconde, and a mouth-watering cashew caramel. On the right, two of their famous Parisian macarons (a pumpkin and a maple walnut), their Florentine and the pear ginger frangipan. I swooned over the cashew caramel. This has risen to the tip-top of my holiday gift list. People would kiss you if you sent them a box of these babies. Which you can. The true beauty of Pistacia Vera is that you can get these creative and inspiring bites, along with tremendous coffee for the same price as your typical afternoon chain coffee stop. So get thee to German Village for an unpretentious little break. And when you do, make sure to invite me along. You know I’m game.